Val located this special area that had a number of rarely found wild flowers. 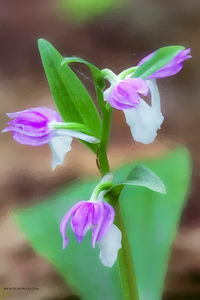 These Wild Orchids, tiny, yet so beautiful when close up with the right optics. We found a number of these along the trail and all the conditions were just perfect to bring home several images with great rhythm.